Want to see the names written correctly? Try a version with Czech characters. 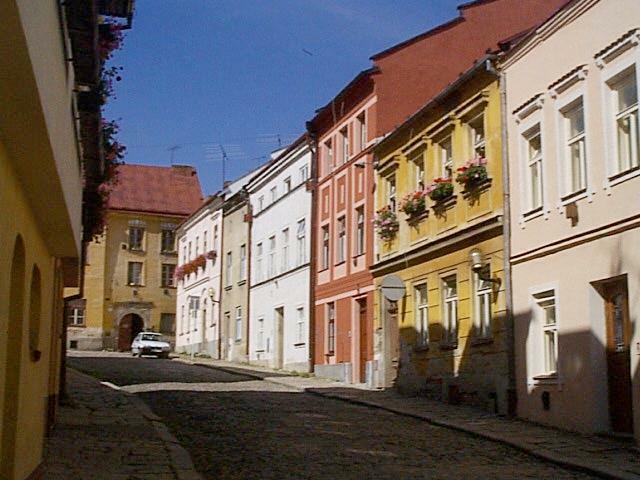 Here are some touristy photos of Jihlava, in the Czech Republic, that I took in August 1998. 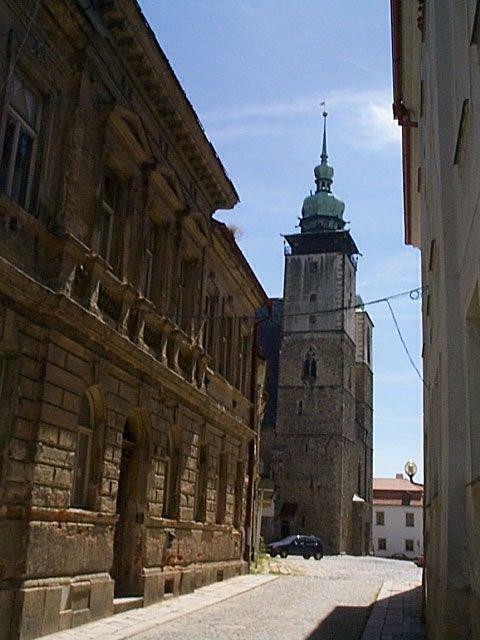 Jihlava (Iglau in German) is just off the autoroute from Prague to Brno. 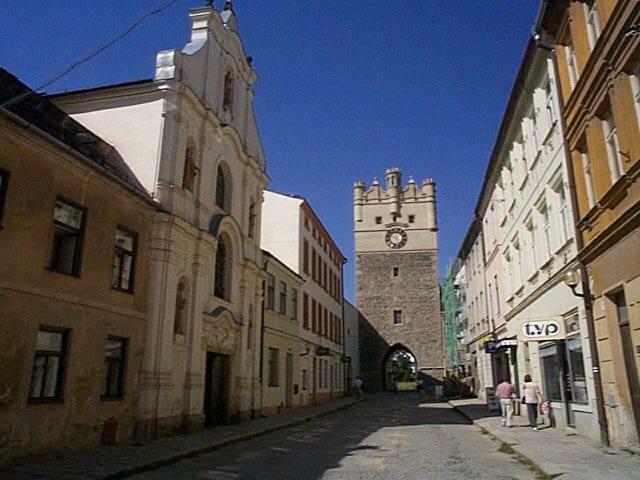 It's near Telc, and worth a detour. 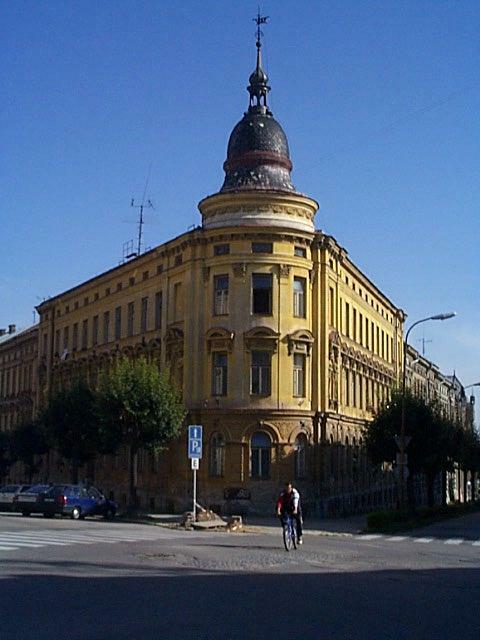 The town originally became prosperous from silverworking, and had a large Jewish population. It has an enormous central piazza, disfigured not only by lots of cars (as everywhere) but also an ugly supermarket. Still, you can ignore the supermarket and enjoy the rest of the architecture, and also spend time in any of the numerous small museums, or even the zoo. 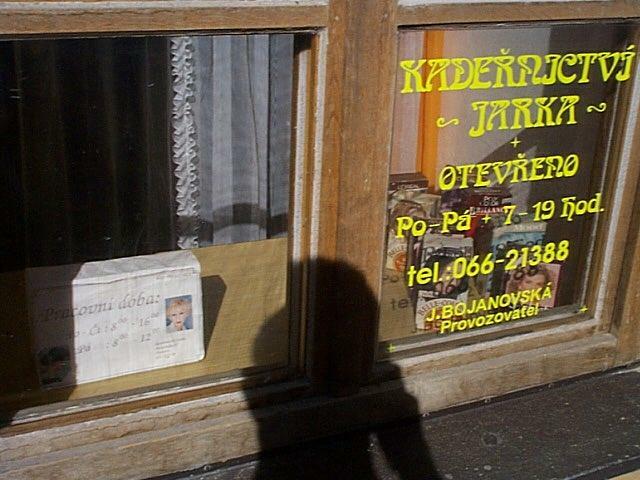 Some of the factual information here is cribbed from Zdenek Jaros, The young Gustav Mahler and Jihlava (Museum of Highlands in Jihlava, 1994). The main piazza and the main church, with a trailer advertising open-air cinema performances. 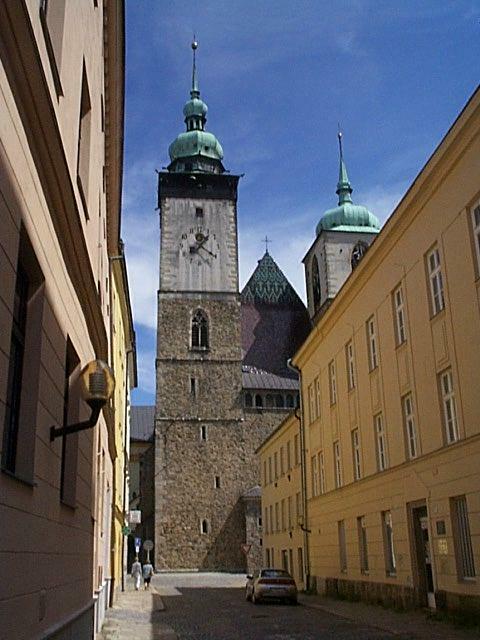 Just off the main piazza, a church redolent of central or even eastern Europe. 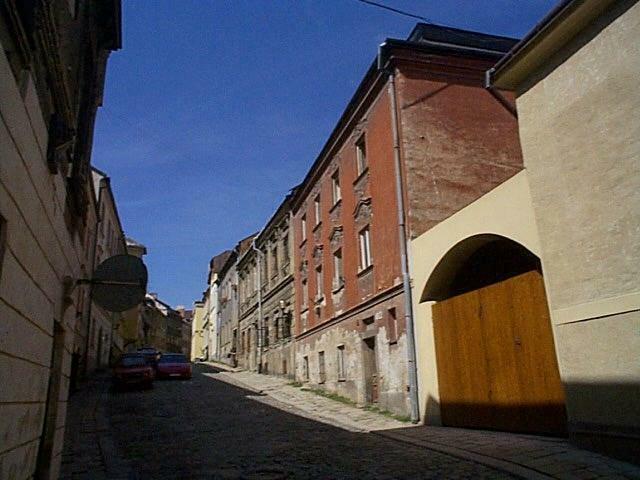 All that's left of the synagogue, viewed from the outside. 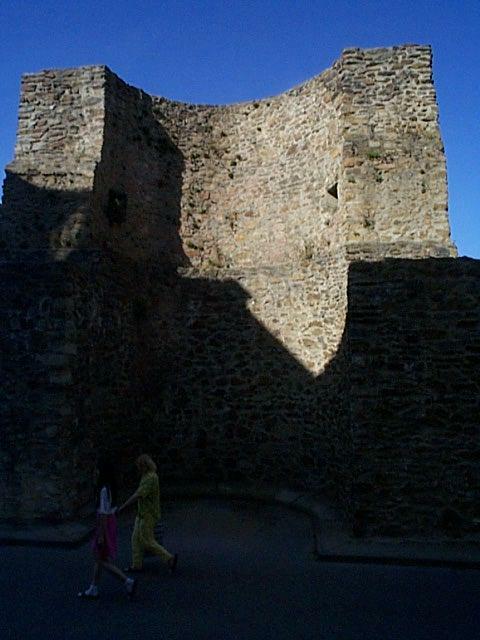 (It was severely damaged by the SA in March 1939 and knocked down after the war.) 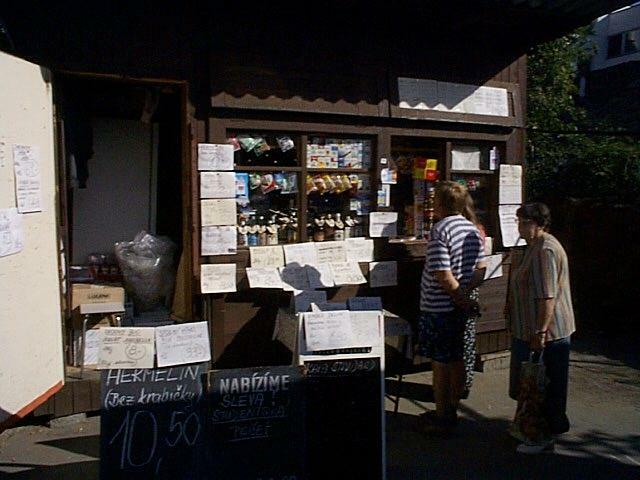 And a shop selling fags, booze, etc., where the synagogue once stood. A corner of the hotel where I stayed. Handsome building slightly away from the center. The obligatory "peeling paint" photo, updated with a satellite disc. Stylish, to go with the Mucha-esque typeface. 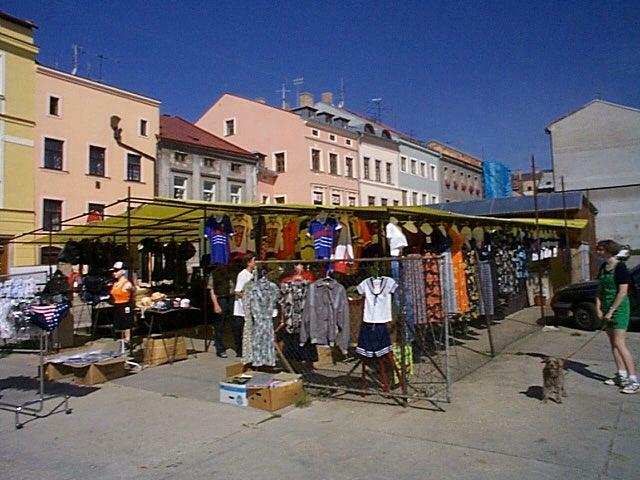 Another market. The clothes business seems to be run by Vietnamese. Unfortunately they don't speak French or English. I got a pair of no-name sneakers here. The church on the left has a very old interior, but the priest looked somewhat forbidding so I didn't do much more than enter. 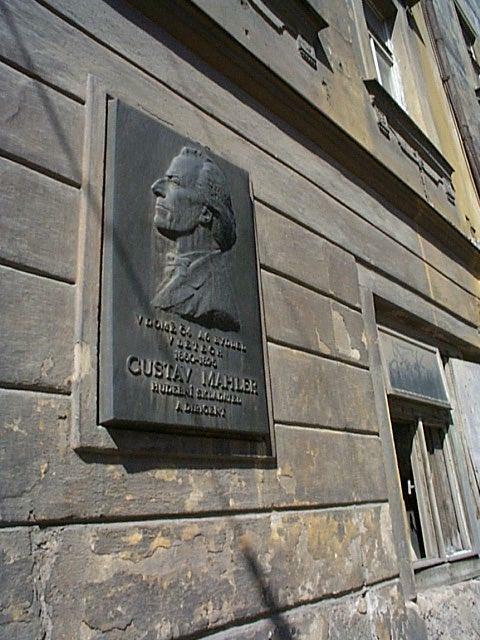 A plaque (by Milan Knobloch) unveiled in June 1960 to commemorate the hundredth anniversary of the birth of Gustav Mahler, who lived here from three months after he was born until September 1875 (aside from a brief and disastrous stay in Prague). 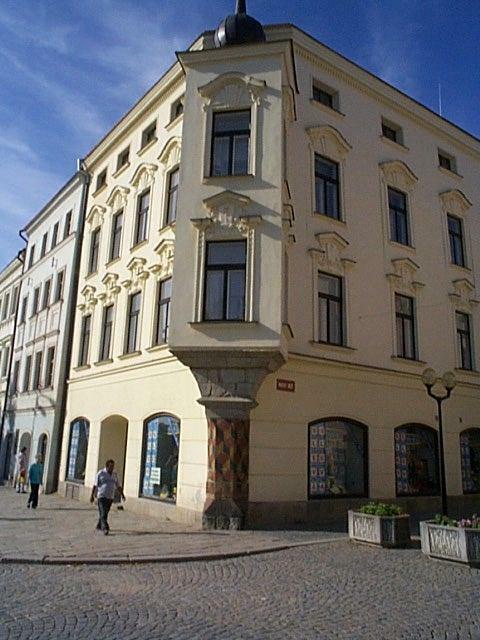 The house, where his family lived, is Znojemská 4 (at the time no. 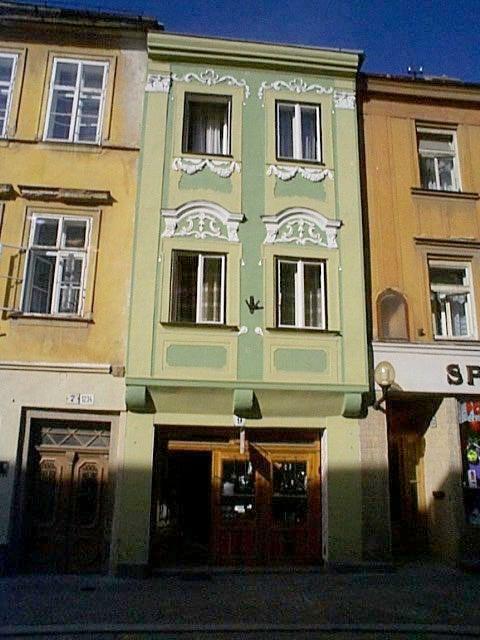 265, Brtnická St.). 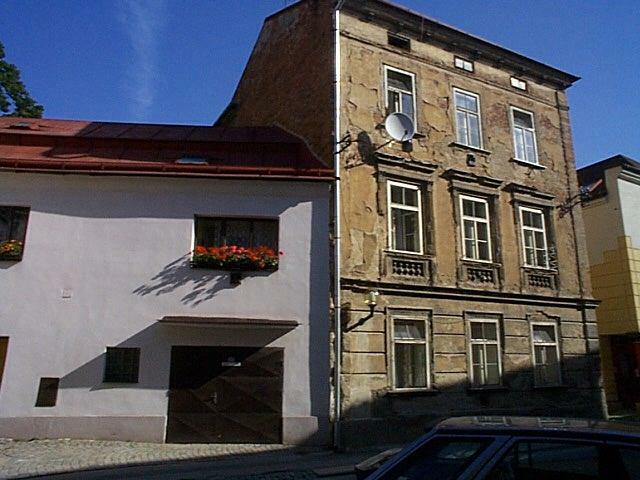 It is very dilapidated -- much more so than as shown in a photograph (displayed at the nearby Mahler museum) taken at the time of the unveiling -- but is being restored. 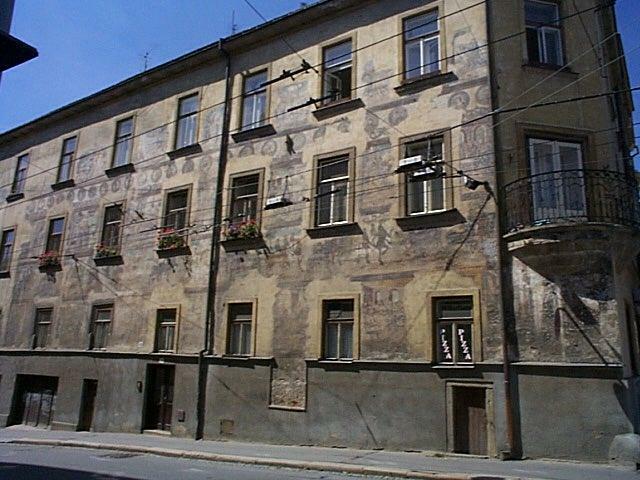 Just around the corner from the Mahler plaque, a house with once splendid but now fading murals. 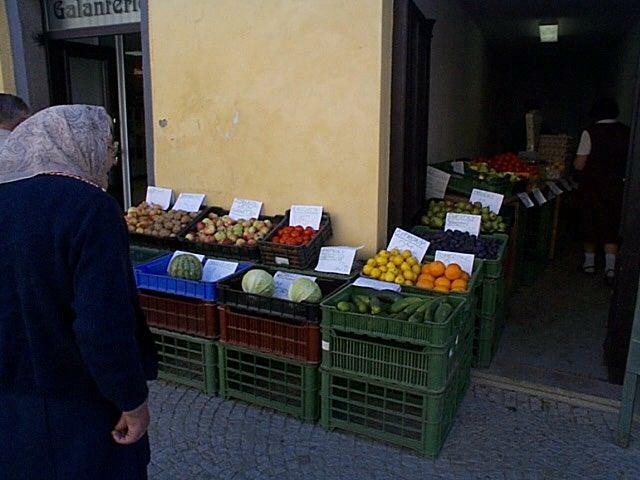 If only this were in the Engadine, it would be tarted up. . . .
Assorted colors in shopping streets and side-streets. Not many wear scarves on their heads. 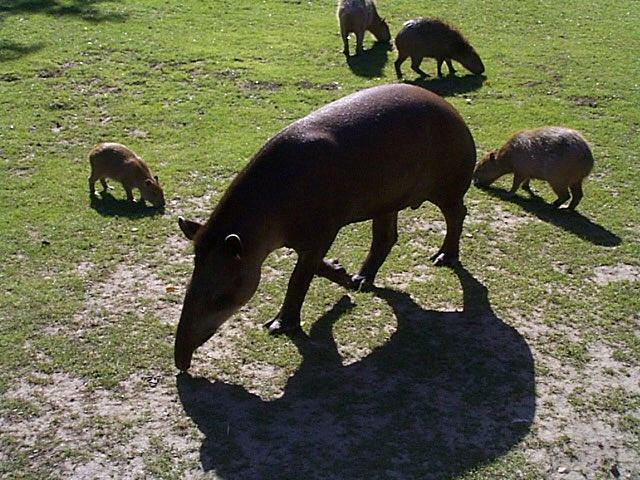 Tapirs and capybaras in Jihlava's excellent -- small, intimate, uncrowded -- zoo. 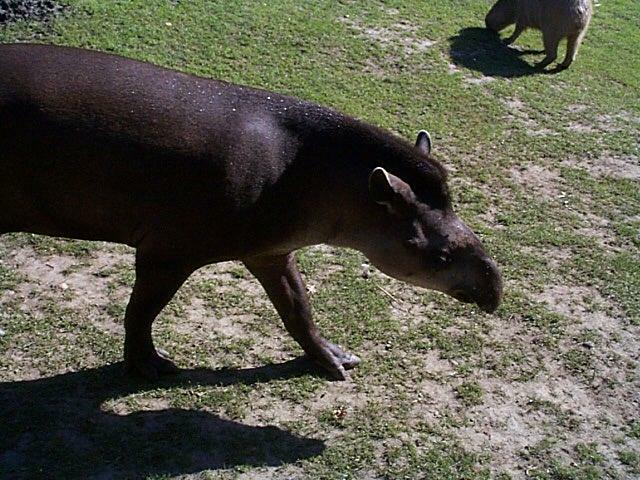 This was not taken with a telephoto (which the camera lacked): they were happy to come close. First created: 12 December 1998. Last fiddled with: 17 June 2003. 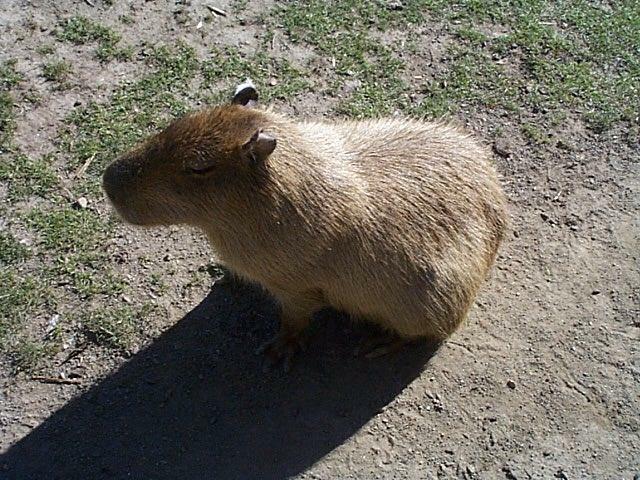 Many thanks to Ellen Cousins for a zoological correction.